Dr. Porter's "School for Anatomy"
Following Fortunes death in 1798, Dr. 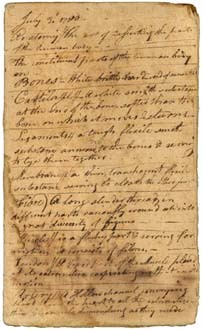 Preserved Porter prepared Fortunes skeleton for anatomical study, reportedly opening a School for Anatomy in Waterbury, giving local doctors an opportunity to learn from the bones. Medical skeletons were extremely rare; Fortunes skeleton was studied by all of the Porter doctors and, quite possibly, by many doctors in the region. Waterburys first physician was Dr. Daniel Porter, one of the early settlers of Waterbury and grandfather of Dr. Preserved Porter. Daniel Porter had learned his trade from his father, just as Preserved learned from his father. Beginning in 1714, Daniel Porter became the towns bone setter, while Ephraim Warner was the general practitioner. The Porter family produced several generations of bone doctors and general physicians. Daniel Porters grandsons, Timothy and Preserved, worked as a general physician and a bone setter in Waterbury during the last half of the eighteenth century. Most medical practitioners in colonial Connecticut learned their trade through apprenticeship. Medical books were scarce; many doctors kept notebooks copied from published works. Still other practitioners had no training whatsoever, but promised to cure every disease, including cancer. Connecticut passed several laws during the 18th century banning the sale of drugs or other medicines by quacks. The need for sound medical knowledge was of great concern throughout the colony. Waterburys Rev. Mark Leavenworth delivered a sermon to the General Assembly in 1772, urging the legislature to bring to the art of healing the same level of education found in mathematics or astronomy. Leavenworth noted that the well-trained physician should be able to penetrate into the human structure, to learn wherein a healthy state consists and what is essential to it...to learn the nature of medicine and of diseases... and that a physicians lack of skill and experience could prove fatal for his patients. The study of medicine in the late eighteenth century was in transition from medieval practices (purging, bleeding, vomits, and blistering) based in a belief that the body was made up of humours (bile, phlegm, blood and the like) to theories based on empirical study of the physical properties of the body itself. In addition, the late eighteenth century saw a movement to create medical associations and schools to exchange scientific information and improve the practices of the profession. Litchfield County physicians organized the first medical society in Connecticut in 1766 in order to advance medical knowledge. The New Haven County Medical Society was founded in 1784; Preserved Porter joined the society in 1785. The new interest in empirical study required bodies to dissect and examine. It was illegal to practice dissection in the United States before 1834, and remained illegal in most states until the 1870s, although Massachusetts permitted the dissection of an executed criminal for medical study once every four years. Therefore, obtaining cadavers for medical study was difficult. Grave robbing by medical students led to riots in New York in the 1780s and in New Haven in 1824; Connecticut officially prohibited grave robbing for medical dissection in 1810. Throughout the nineteenth century, cadavers for medical studies were taken disproportionately from the less powerful members of society: slaves, servants, the indigent and the imprisoned. Who Was Fortune? | How Did the Skeleton Get to the Museum? 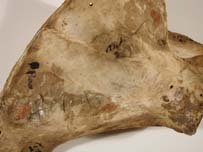 Detail image of Fortune's scapula, showing 18th-century script identifying the area of the bone. 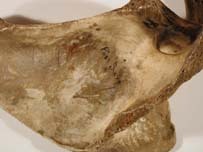 Detail image of Fortune's scapula, showing 18th-century script identifying the areas of the bone. Detail image of the interior of Fortune's skull, showing 18th-century script identifying the area of the bone.